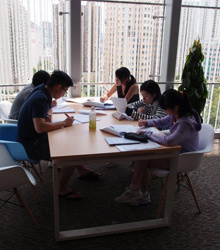 My daughter took private lessons with The Open Classroom for four months before she attended the admission tests in three top international schools in Hong Kong last year. She passed the tests and got admitted to the school of our top choice. My daughter has been a student of The Open Classroom since its inception. The teachers understand very well about her strength and area of development. They designed a very effective program to customize her needs. The results have been very satisfactory. We are very grateful. The Open Classroom has been a terrific experience over the last two years. Our daughter has been participating in various modules since The Open Classroom started and we couldn't be happier. The Open Classroom helps young people build confidence while learning about interesting and socially meaningful topics such as fair trade and helping people with disabilities. Most recently our daughter has taken part in an Intensive Writing module as well as an SSAT Preparation course. The time and attention that the instructors have provided has given our daughter significantly more confidence and meaningful advantage. In the end our daughter was accepted at both of her target boarding schools. More importantly, however, we feel the students are really inspired by the instructors and look forward to attending. We fully recommend The Open Classroom as a wonderful supplement to any child's education. After doing poetry workshops with Mr. William Wong, Christopher Chow participated in the annual Hong Kong Young Writers Awards. For his submission, he wrote a masterful and eloquent poem about the Pearl River Delta. His poem was selected as one of the award-winning works, and will be published in the upcoming HKYWA Anthology. We at The Open Classroom are delighted and would like to congratulate him on his achievement. Arranged on an individualized basis. The Open Classroom (formerly known as LEAP Studio) was founded with a mission to equip students with the knowledge and skills to apply classroom learning into real world context, empowering them to make a difference in their community. Our afterschool learning institution provides an interactive environment for children and teenagers to develop writing, presentation, critical thinking and other leadership skills through curricula designed and taught by high caliber and passionate teachers. © Copyright 2019 The Open Classroom. All rights reserved.